We’ve all been in the situation where we were looking to buy a product, and we had to browse through a multitude of portals and websites to find the most affordable offer for it. Actions like this can take a lot of time sometimes unless you use the right tools. Pricepirates portable is one of the applications that can help you when you are looking for the cheapest price a specific product features on multiple websites. It allows you to view and compare offers from multiple sources directly on its main window. The application comes with a simple GUI (Graphical User Interface) that makes it suitable for both beginners and advanced users alike. Right from the start, you only need to input a search query, and the software returns the desired results in almost no time, just as any search portal would. By default, the software displays search results from five different sellers, in a separate tab for each of them. However, you can close any of these tabs, and you can also lock/unlock them effortlessly. The program allows you to save any of the search queries in the form of favorites, which makes it easier for your to access the returned results at a later date. On top of that, you can add items to a watchlist, so as to stay informed on changes for a specific entry. You can use Pricepirates to create Shopping Lists that make it easier for you to keep track of multiple offers at the same time. You can view info on the price tag of a desired product, details on the website where it can be found, and info on when a given offer on it expires. With the help of this application, you can also view bargains from specific websites. It allows you to search for bargains in desired categories, and you can also filter the returned results by price, expiration date, or max bids. 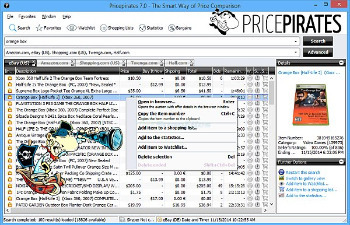 To conclude, Pricepirates is a straightforward, snappy application for finding online offers on specific products. It allows you to compare prices from multiple websites, to create shopping lists, and to find bargains, all from the same simple, intuitive interface. • Enter the search terms, select your favorite marketplaces and let Pricepirates search the best offers for you. • Restrict the search queries: Price range, Free shipping only, Shipping to specific locations, Merchants, Product conditions and many more. • Individual entries from the result lists can be saved in a separate watch list. • Integrated alert function reminds you of auctions ending soon by SMS, E-mail or a message window. • Using the Statistics for long-term observation of several identical items can provide, for example, a good overview of the average selling price of this product in Online auctions. Moreover, the price development can be analyzed in regards to specific factors such as time of day and weekday. • The favorites function enables you to save search queries including all selected parameters and limitations with a single click. This makes it unnecessary to repeat the entries when you want to retry the search later.